It’s been a long time since I bought bread. My favorite no knead bread is multi-grain and I decided to try it with some added ground flaxseed meal to see if it turned out. I love it! 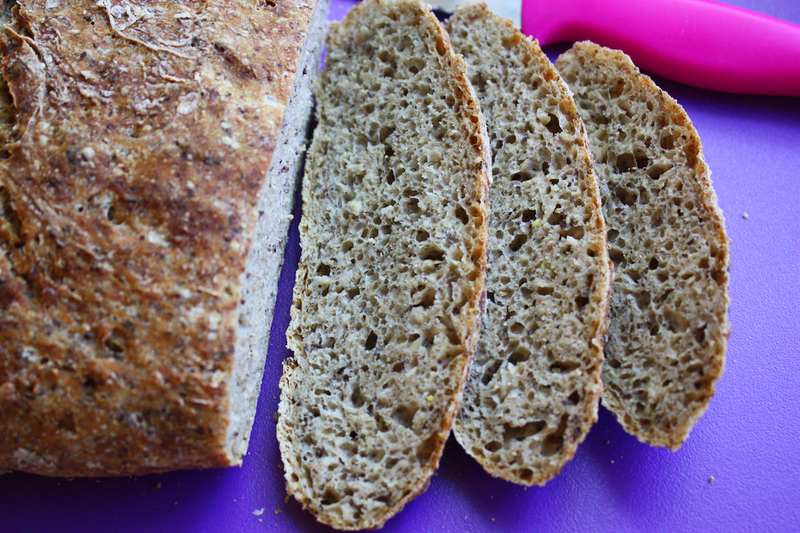 This was a high fiber bread to begin with and now, with added flaxseed, it has heart-healthy benefits because flax is a good source of omega-3 fatty acids. 2 Comments on "Multi Grain No Knead Bread with Flax"
Hi Jenny, What a wonderful person you are sharing your talent and recipes! What happens, if one leaves the oatmeal out, and works with regular flour, whole wheat flour and a bit of flax? I am already making this recipe, but just discovered working with less yeast and using the overnight method. Oatmeal feels too sweat to my taste. Can I just omit/replace it? I have made many different combinations of no knead bread with success every time. I’m sure using whole wheat and white flours with flax will work but the more flax you use, the heavier and more dense the bread will be so I suggest starting out with 1/4 cup at first and then experimenting.